At Deckstainhelp.com, we appreciate your feedback. It is our commitment to remain your number one source for tips and latest industry news for all things deck stain related. 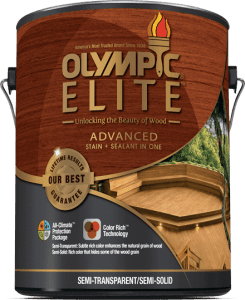 Olympic Elite Wood Stain continues to receive average to above average reviews as years before. 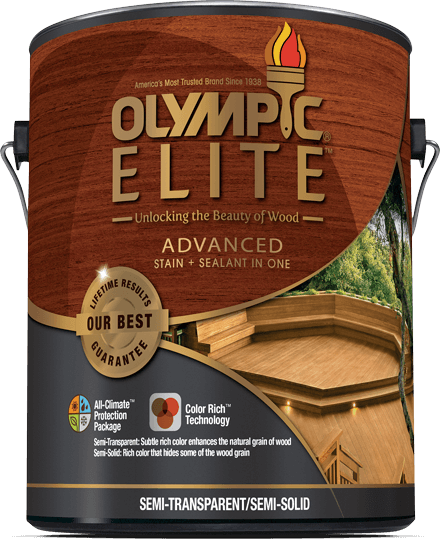 Leave us a comment if you’ve used Olympic Elite Wood Stain and let us know how your projects held up. This is for the 550 VOC versions that is an oil based stain. – Olympic Elite Stain is an oil-based stain + sealer in one. We used the Chestnut Brown color. The appearance of the final stain finish was a brown color that did not seem to enhance the beauty of the wood as well as we had expected. However, the Olympic Elite Wood Stain did penetrate the wood fairly well and did not form a film on top. –At the 2-year test mark Olympic Elite Woodland Oil did hold up pretty decent with an estimated 70% color retention. Some fading and graying were noticed in traffic areas. 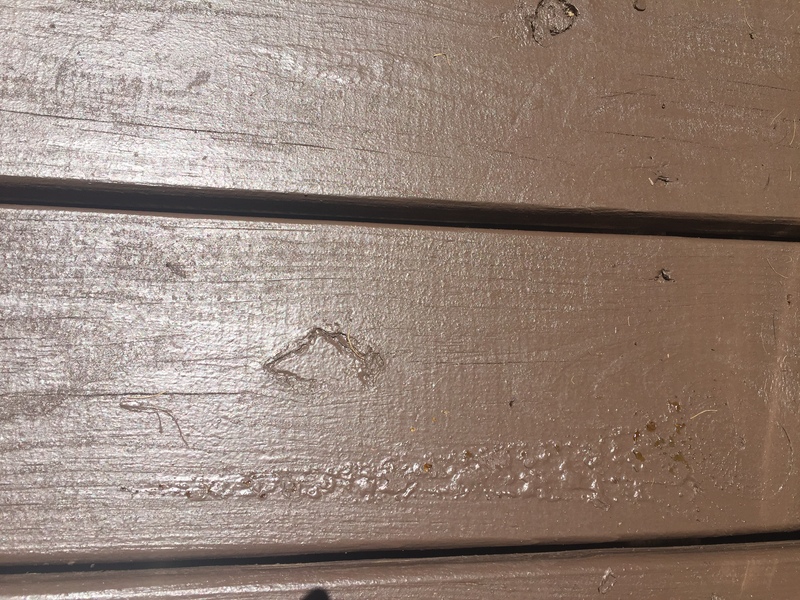 –As mentioned the Olympic Elite Wood Stain did show signs of fading but no peeling. Most of the fading and wearing was on the horizontal surface like the tops of the handrails and deck flooring. There were almost bare areas with no stain left in the high traffic sections of the deck. 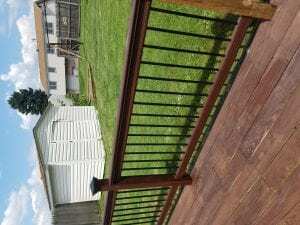 – It took 4 gallons total of Olympic Elite Deck Stain to coat the entire 600 square foot deck. The manufacturer claims 250-350 square feet per gallon but we experienced closer to 150-200 feet per gallon. 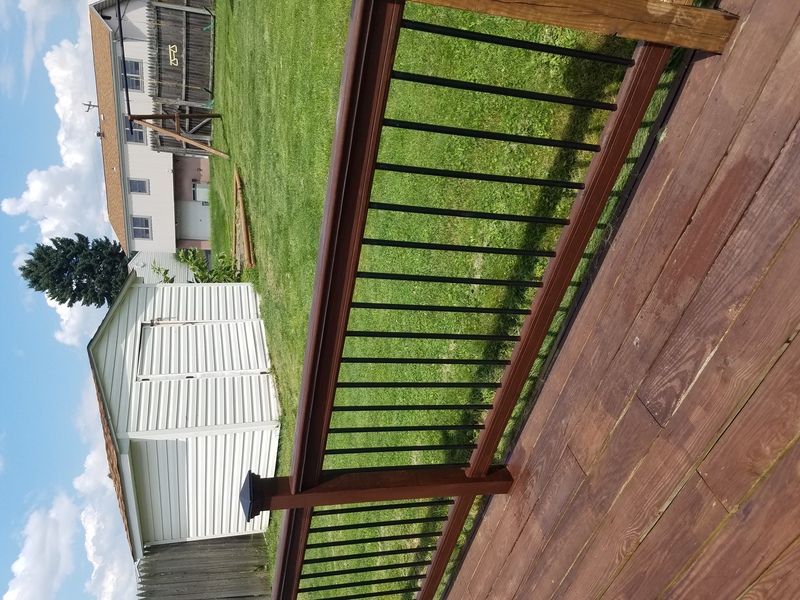 – Olympic Elite Deck Stain plus Sealer provided a powerful mildew resistant coating and did a decent job at preventing fungal growth. – The Olympic Elite Stain was average to apply. We did a one-coat application using a stain pad and did not get great coverage. We did notice some overlap marks when finished. – At the 2-year mar,k we didn’t notice any darkening due to no mildew but the Olympic Elite Wood Stain did lighten up on 90% of the deck. – We did have to strip the old stain off due to bare wood and graying showing in high traffic areas and lightening of the stain in other areas. – The Olympic Elite Advanced Stain + Sealant was above average score overall. The stain did hold up fairly well except in high traffic areas and no mildew was present. We were not overly happy with the coverage rates and having to strip the stain off prior to recoating. The stain has only been on for 4-5 days but there are bubbles on some flat surfaces and it’s overall tacky. What gives did I do something wrong? Could be improper prep or over application. We are currently in dispute with the Co over the same issues which i occurred 10days after application. It started bubbling & when my husband walked out to look @ them, the tackyness actually left footprints permantely; it only got worse from there! I called the Co ahead of time as we do hv severe weather & being a 2nd story deck, he only wanted to do this project once. My husband prepped stairs & deck according to their specifications per the phone call using all of their products per the warranty. I did notified them immediately & almost a yr in they are willing to reimburse us fr the product, however, it is peeling so badly it looks like it’s been on fr 30 yrs & dreadfully neglected. They sd it’ll nd to be sanded off-my opinion is they can rectify tha themselves by sending someone or reimbursing us costs. They just lost another class action lawsuit fr issues like this w/another product of their’s. I hv experts that saw before, during, & after this was applied. We waited 18mnths-the proper amount of time fr pressure treated wood, along with multiple pictures of before application, when it started & how dreadful it looks now. I don’t back down when I know took all the correct steps, paid a higher cost for their “super premium stain” and called in advance to make sure this would be the correct product for our weather. BTW-the few areas where it ws over applied by the brush are the only ares that hv not started to peal/chip yet so ur not alone. They offered a full refund of product price immediately aftr seeing the pictures as well-I don’t believe it came as a shock to them. More is not better with deck stains. 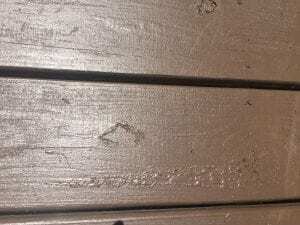 We painted our decks with Olympic Elite Solid and were very happy with the look but now one week later we have sticky gooey bubbles coming up all over. What can we do to remedy this? It did not adhere there. You will need to sand these spots and then reapply. Would I wait until it cools off in fall? After the proper drying time, can you put a coat of Elite solid stain over a first coat of the same color, semi solid stain, and get good results? Probably but best to ask them directly. Hi, anyone applied Olympic Elite on Ipe wood decks? I just got new Ipe decks and planning to apply Olympic Elite. Would really appreciate some feedback if oneone had experience on this. San Jose, CA. Sorry but no we have not used it on IPE. how long does one need to wait for the water to dry after washing to apply this stain? Is elite an oil base or water base stain. The above specs say both. We tested their acrylic water based version. They also have an oil based version. Depends on the brand you used and what they suggest. We bought 7 gallons of stain. Did one project and turned out good. Did second deck and turned Orange. Way different. How can 7 Gallons be different? Different colors and or different formulas. Does the Olympic Elite have a similar coverage rate as Armstrong Clark? According to the two reviews AC was 3.5 gallons used for 600 sq ft or $0.24/sq foot. Olympic Elite was 4 gallons used for 600 sq ft or $0.23/sq foot. I ask because the AC got a “Cost per Square Foot” rating of 9 vs this products rating of 6. If im reading correctly both used only 1 coat of product…Thanks for any insight! The AC covers more per gallon. No. It will enhance the spots. Some old boards were replaced on my deck in January, 2017, and am now ready to stain. The old boards were stained with Cabots Semi-solid. Do I still need to use a semi-solid stain? Same Cabot or a solid stain to cover all. Other option is to remove all of the Cabot semi-solid by stripping and sanding. Once removed, you can use any stain type. If you cannot remove 100% of the old coatings, you will need to go to a solid stain. I would follow their directions as to the amount of coats needed. Sorry, not possible to imitate the wood grain. Does the Olympic clear sealant cause new pressure treated wood to turn green guy at Lowes told me that? If it has no color or tint, the wood will gray naturally.